The U.S. 126 chassis had two variations in the front end headlight design. From 1981 to 1985 a rectangular seal beam headlight bulb was used with a separate glass yellow fog light. On sedans, that was mounted just inboard of the headlight bulb. In 1986 the shape of the headlight changed and the fog light bulb was mounted behind a plastic headlight grill. 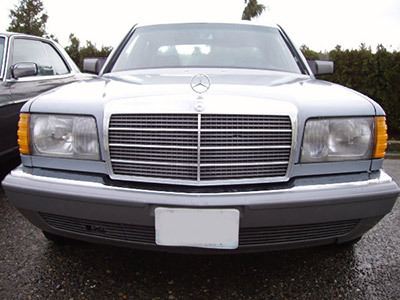 The European headlight as shown in the picture above had a much cleaner look and is a popular upgrade today. The 126 chassis was built with sedan and SEC coupe bodies. The coupe was big and luxurious and the sedan proved to be a great road car. The coupe only came with a V/8 gas engine, but the sedan was made available with 5 and 6 cylinder diesel engines and V/8 and 6 cylinder gas engines. Both remained in production through 1991.